A simple test by ear can reveal if the intonation is set correctly. This check will be made easier if the guitar has been fitted with new strings. * Check the harmonic at the 12th fret by lightly touching the string and sounding the note. * Now play the note at 12th fret, if the latter sounds sharp or flat compared to the harmonic an adjustment is needed. * A more accurate assessment can be made by using an electronic guitar tuner. 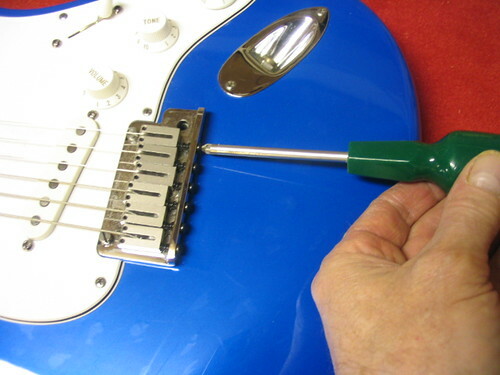 If the played note is sharper compared to the harmonic, the string length will need to be lengthened. Locate the string length adjustment screw on the bridge, rotate clockwise to lengthen. Repeat this process until the harmonic note and the played note correspond.